Decorative Life: Can last 1-3 weeks depending on stage purchased and interior conditions. Harvest when the first florets just begin to show color or earlier. Growers can use Florel to reduce or prevent stem topple. Native to the Mediterranean region and South Africa. Common relatives include tulip, lily, burn plant (aloe) and asparagus. The inflorescence is 4-6 inches long with bell-shaped florets. Stems are leafless (scape), thick and fleshy, 8-12 inches long. Flowers produce very strong and pleasant fragrances. Marketable plants should be stored at 32-36F. Some less than honorable individuals have sold individual flowers of white flowered cultivars for the much more expensive stephanotis flower, also known as Madagascar Jasmine. With over 3000 species, the lily family includes many medicinal and food species in addition to ornamentals. 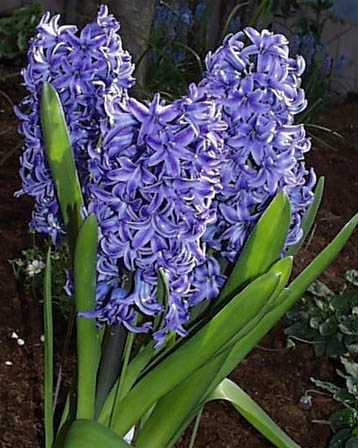 Hyacinth bulbs have been known for years to cause skin irritation, contact eczema and respiratory irritation in humans. Piirila et al. (1998) were the first to document occupational asthma caused by hyacinth.